Below is the current iteration of our budget. Our gross income in 2013 was nearing $60k, but we only budget off our income from our grad school stipends and leave out interest income, investment gains, and side hustle income. 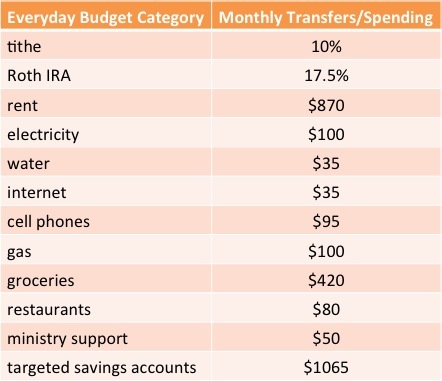 These are the spending categories for our everyday budget. This adds up to about $40 less than our net monthly income from our stipends – we like to keep a little wiggle room each month for unexpected expenses. 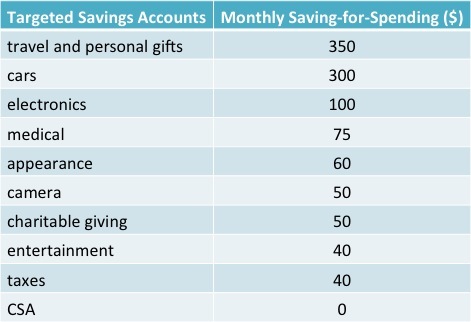 Below is a breakdown of the money we transfer to our targeted savings accounts monthly – this is money that we plan to spend in approximately the next year, but which generally is spent in chunks too big for our monthly budget to handle. Any side income we receive is split up according to our percentage-based budgeting principles when we receive it. Every month for the couple years I’ve published a monthly spending report here on the blog (month in review). At the end of every month we “zero out” our checking account so that every dollar of our income that hasn’t been spent or transferred elsewhere gets transferred to one of our savings accounts of choice. Our account of choice at the moment is our general savings. We’ve been pretty successful in having leftover money in our checking nearly every month! 21 Responses to "Our Budget"
Any Updates on this page? Ha, pretty out of date right? Thanks for bringing it to my attention!